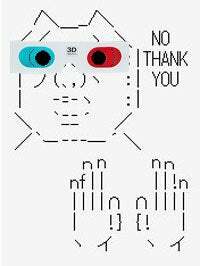 The general public has yet to see the upcoming 3D-glasses-free Nintendo 3DS. It will be playable sometime this year. Exciting, no? Well, not to some folks in Japan. Nintendo has described the portable as allowing games to be "enjoyed with 3D effects without the need for any special glasses". The Nintendo 3DS will succeed the Nintendo DS series and will have backward compatibility for Nintendo DS and DSi games. Japanese goo Research polled 1,059 members of its monitor group about consumer electronics. According to website What Japan Thinks, 52.9 percent of the sample were male, 16.1 percent in their teens, 17.8 percent in their twenties, 21.5 percent in their thirties, 16.2 percent in their forties, and 28.3 percent aged fifty or older. Would you like to get the recently-announced Nintendo 3DS, featuring 3D that doesn't require special glasses? Like I said, the general public has yet to see the Nintendo 3DS, and once it does, these numbers *should* change, no? Another thing to keep in mind: This is not all Japanese people. 3D televisions seem poised to be a big deal in Japan. The Nintendo 3DS is positioned to ride that wave of popularity.